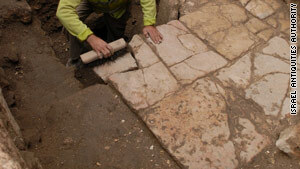 Archaeologists have uncovered a 1,500-year-old road running through the center of Jerusalem's Old City. Jerusalem (CNN) -- Archaeologists working under the direction of the Israeli Antiquities Authority have uncovered a 1,500-year-old road running through the center of Jerusalem's Old City. Excavation director Dr. Ofer Sion said the discovery lends further credence to the accuracy of what is known as the Madaba Map -- a Byzantine period mosaic map of the Holy Land that depicts an entrance into Jerusalem that leads to a single central street. "It is proof of this beautiful map and for this street from the Byzantine period," Sion told reporters at the dig location. The ancient road was found near the Jaffa Gate of Jerusalem's Old City 4.5 meters under current street level when municipality workers initiated an infrastructure improvement project. The road dates from the period when Jerusalem was under Christian control and was constructed with large flagstones of more than a meter in length. The road connected the western wall of the city to the eastern side of Jerusalem, Sion said. When the street was in use according to Sion, "hundreds of thousands of people are reaching the city, pilgrims from all over the world, and they are coming to Jerusalem and entering through the gate and going down the center, to the market of the city. They are going down in this street." Next to the road archaeologists also discovered a stone foundation which supported a sidewalk and a row of columns. "It is wonderful to see that David Street, which is teeming with so much life today, actually preserved the route of the noisy street from 1,500 years ago," Sion said.